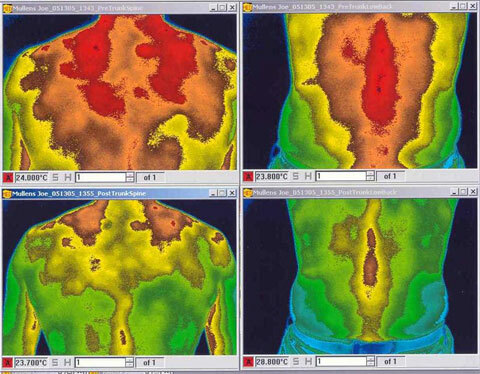 The red is inflammation and heat associated with pain in these Infrared photographs. The blue indicates low temperature. The lower photos reveal what happens within seconds of applying the pain relief technology provided by EzyHealth. What is the usual way of dealing with physical pain? When it becomes intense, the usual thing is to use a pain-killer, commonly a pill swallowed with water. Much pain, however, is simply put up with. Even after taking a pain-killer there might yet remain pain to put up with, and then there is the problem of becoming tolerant to the drugs so that the dose is perhaps increased in order to keep yielding results. Surely, that is very undesirable. Therefore, the use of a method which does not diminish in effect and that does not drug the mind and body is sought. 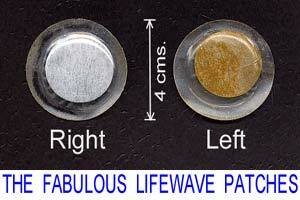 For more and more people, IceWave is the choice. IceWave can be so effective that it is difficult to believe. I have seen it happen time and time again, the disbelief, and even the rejection of the reality as if it is some magic trick being played. Yes, as if it is a magic trick, like some sort of hypnosis. But it is not hypnosis, and not a placebo effect either. It works on animals, it works during sleep. It works by increasing the flow of one's own electricity to the injury in such a way that inflammation and swelling decrease, thus greatly improving tissue function. It works in this way for all cellular matter through which life energy flows: That means muscle, nerve, vessel, organ, blood and bone. Yes, though pain is generally thought of as a sensation of the nervous system, electrically pain may be considered as an electrical dysfunction that can occur even when nerves are not present to convey that dysfunction to the brain. More info ph +61491 020 123 or fill the form.